GA-Z270X-Gaming 7 belongs to new AORUS Gaming line of Motherboards which support Intel’s® 7th / 6th Gen Core processors. GA-Z270X-Gaming 7 motherboard designed for enthusiast, allow for customization and personalization through unique features such as fully customizable RGB LEDs as well as a new and improved smart fan controls which are all meticulously incorporated into this platform to give gamers more control as well as the ability for them to express themselves. 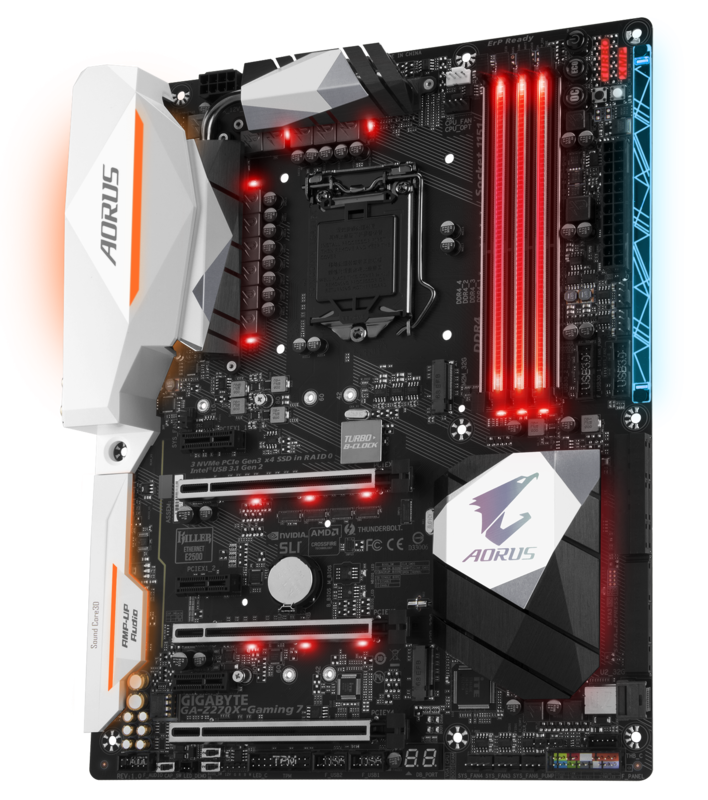 Powered by Intel's own Thunderbolt controller the new Thunderbolt™ 3 protocol, which is available over a USB Type-C™ connector on the back I/O of the GA-Z270X-Gaming 7 AORUS Gaming Motherboard, brings an unprecedented single-wire bandwidth of up to 40 Gb/s -- twice more than the previous generation of Thunderbolt! This incredible increase in bandwidth is also accompanied with support for different protocols such as DisplayPort 1.2 and USB 3.1, which is backwards compatible with USB 3.0 and USB 2.0, opening up a world of new possibilities.